Table-top sweetener based on erythritol and steviol glycosides. Sweetness from the stevia leaf. Cooking & baking. Muesli & yoghurt. Hot & cold drinks. The perfect alternative to sugar. 100% made from natural sources, crunchy like sugar and with zero calories. Gluten free. Suitable for vegans. Kosher.Enjoy the great tasting sweetness in SteviaSweet which comes from the leaves of the Stevia plant. 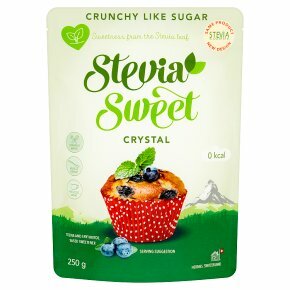 SteviaSweet Crystal is the smart new way to sweeten - with 0 kcal. It is also heat stable, so it's perfect for baking, cooking, desserts, beverages and on fruit and cereals.